Masters of language can turn unassuming words into phrases that are convincing, effective, and memorably beautiful. Lincoln and Churchill had this power:having heard their words once, one can scarcely imagine the world without them. What are the secrets of this alchemy? The answer lies in rhetoric, among the most ancient of disciplines. This book contains a lively set of lessons on the subject, a tutorial on eloquence conducted by virtuoso faculty. The result is an indispensable book for the writer and the speaker, a highly useful reference tool, and a rewarding source for all lovers and users of the English language. 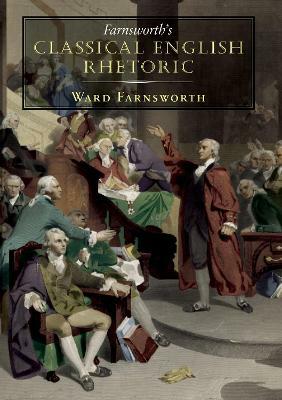 "Let me close with an example of hypophora--asking a question and then answering it: Should you buy Farnsworth's Classical English Rhetoric? If you're at all interested in the techniques of writing, yes." -- Michael Dirda "Washington Post"
"What might have been a dry analysis full of Greco-Latin terminology becomes an enchanted garden of lively English prose...the book is beautifully designed and provides its examples in a handsome format...I admire it; I appreciate it; I recommend it." -- Steve Dodson "The Millions"
"The most immediate pleasure of this book is that it heightens one's appreciation of the craft of great writers and speakers... and to rehabilitate writers and speakers whose rhetorical artistry is undervalued...more than anything Mr. Farnsworth wants to restore the reputation of rhetorical artistry & the result is a handsome work of reference." -- Henry Hitchings "Wall Street Journal"